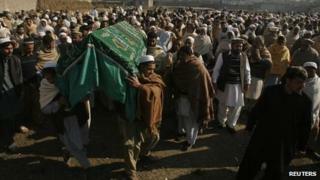 Funerals have taken place in the Swabi area of north-west Pakistan for seven charity workers, six of them women, who were gunned down on Tuesday. The workers, some of them teachers, were attacked near a children's centre. Correspondents say it is not clear if they were targeted because their charity offered vaccinations or education for girls. Militants have targeted polio vaccination programmes before and are also opposed to girls' education. But no group has said it carried out this attack. The centre the workers were attached to was part school and part clinic, specialising in maternal health and was run by Pakistani charity Ujala, or Light. They were killed when the vehicle they were in came under gunfire near the centre. Five of them were teachers and two were health workers. "Four men came on two motorbikes," Swabi district police chief Abdul Rashid Khan said, according to AFP. "They attacked their van. They opened fire to the right and left of the van and fled on their motorbikes." The bodies of the victims were carried through the streets of their villages by mourners. Hundreds of villagers attended the various funerals. Fazal Dad, the father of one of the victims, said: "I told her many times at home to be careful, as we are poor people, and take care of yourself all the time, and always in response she said 'Father if I am not guilty no-one can harm me'." Last month, in a series of attacks, gunmen killed nine health workers taking part in a national polio vaccination drive. While the Pakistani Taliban have denied carrying out the killings, they have long denounced the vaccination drive as a Western plot either to gather intelligence or to sterilise Muslim children. The killings prompted the UN children's agency and the World Health Organisation to suspend work on polio campaigns in the country.